This article explains how to customize the different display options, and how the results look like. 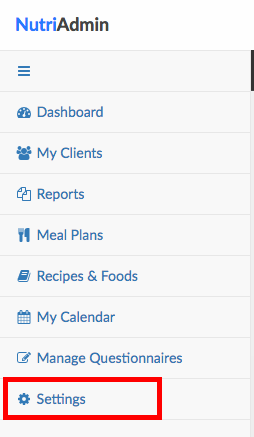 Step 2: Click on the Meal Plans, Recipes & Foods tab. Step 3: Scroll until finding the different options for macronutrients and micronutrients in recipes. You can click on the different radio boxes available to change between options. Step 4: Do not forget to record your changes by clicking on the Save Changes button on the top-right corner of the screen. Macronutrients and micronutrients are controlled by two different settings, so you can mix-and-match any combination of display options from the alternatives shown below. Showing macronutrients per recipe: this option shows the total amount of energy, protein, fat, and carbohydrate in the whole recipe. If this is a recipe that contains a lot of servings (e.g. a large turkey roast) then you will see very large values in the macronutrients tab. Showing macronutrients per serving: this option will display the amount of macronutrients contained in a single serving of the recipe. Showing both macronutrients per serving and per recipe: You can also display both of the above two options side-by-side. 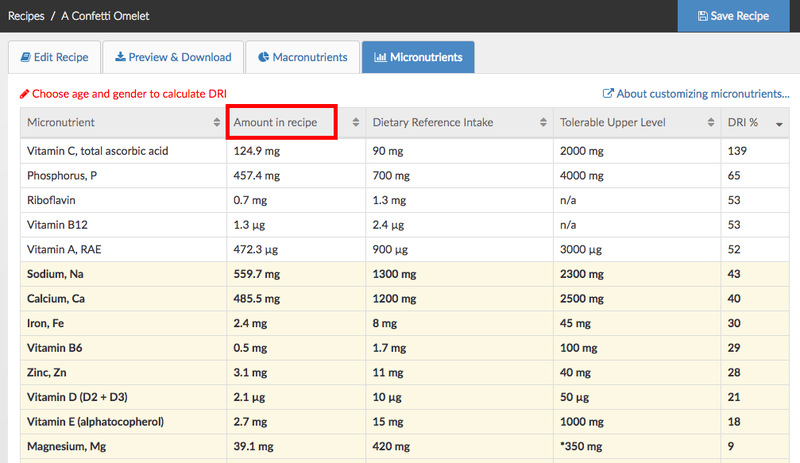 Showing micronutrients per recipe: This option will calculate the amount of micronutrients contained in the whole recipe. The calculations will also affect DRI and DRI percentage. 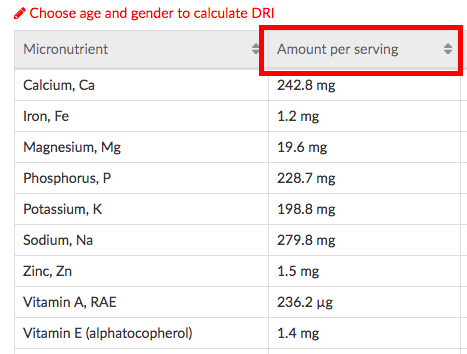 Showing micronutrients per serving: This option will calculate the amount of micronutrients per serving of the recipe, as well as the corresponding DRI values for the serving.